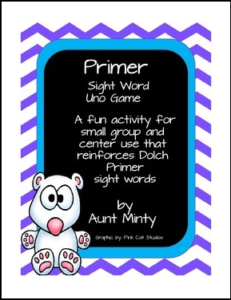 Everyone loves to play UNO and here is a way students can practice their Dolch primer sight words while having fun. My students LOVE to play this game. They are having so much fun playing they don’t realize they are learning! The game is designed for 2-4 players. Simply print each page off on red, blue, yellow, green, and orange card stock or construction paper, laminate the pages, then cut the words apart. The game is just like UNO but instead of matching numbers on the cards they have to match the words on the cards. They also have to read the words on the card they are discarding.